BEACH or BOAT DELIVERY UTILITY BOAT for HIRE!!!!! A 33' high-speed shallow draft landing craft outfitted for rescue, towing, and salvage. 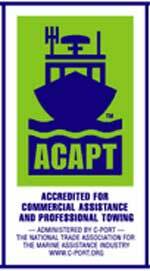 Fully equipped and outfitted to the national (ACAPT) standards for rescue towboats, towing gear, first aid supplies, diving gear, mechanics tool kit, repair supplies , fire extinguishing equiptment, VHF radios, RADAR, cell phone, specialized salvage gear, pumps, and patching materials. Our salvage fleet of vessels is on station 24 hrs , responding to maritime emergency's with Coast Guard licensed, fully insured, trained, and experienced crew.